Bailout Chief Tapped For Tougher Job: Regulating Derivatives : The Two-Way Timothy Massad has overseen the Troubled Asset Relief Program that bailed out banks and automakers. Now he's expected to be nominated to head the Commodity Futures Trading Commission — perhaps an even tougher job. "Timothy Massad, the Treasury Department official responsible for overseeing the U.S. rescue of banks and automakers after the credit crisis, will be nominated to head the country's top derivatives regulator." As head of the Troubled Asset Relief Program, the Journal writes, Massad "helped to wind down the government's stake in Citigroup, General Motors and hundreds of small and midsize banks. His efforts have helped the government recover about $424 billion from the various bailout programs, more than the roughly $421 billion disbursed." That's been a big job, for sure. "If confirmed by the Senate, Mr. Massad would fill the role vacated by Gary Gensler, who has spent more than four years pushing back against Wall Street in a bid to bring more transparency and stricter rules to the multibillion-dollar derivatives market. Mr. Massad will need to finish implementing and overseeing the rules that the CFTC is charged with writing and enforcing amid industry criticism and as international regulators continue to fight Mr. Gensler's now-delayed effort to apply U.S. swaps rules overseas." "The CFTC has been at the center of several contentious battles involving the implementation of Dodd-Frank, with reform advocates cheering on Gensler's efforts to write tough new rules while Wall Street bankers and other business executives warn that the agency is being overzealous. Massad will likely face twin pressures as his nomination moves through the Senate. Liberal lawmakers will press him to commit to carrying forward the approach laid out by Gensler and Republicans and some moderate Democrats will look for him to be more accommodating to the concerns of industries such as agriculture and other end-users that use derivatives to hedge risk." Risky, largely unregulated trading in derivatives gets much of the blame for the 2008 financial crisis that deepened an already painful recession that began the year before. In announcing Massad's nomination, the president "is also expected to call on Congress to stop underfunding agencies like the CFTC," The Financial Times says. Also, Obama is "expected to highlight the CFTC's role in implementing the Dodd-Frank legislation of 2010. The agency has proposed more than 60 rules as part of that effort and is nearly done with the mandates by Congress." 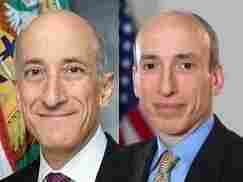 By the way, we do want to call attention to the official photographs posted by the CFTC and Treasury Department with the bios of Gensler, 56, and Massad, 57. We've put them side-by-side. If Massad does take over at CFTC, will some folks confuse him with his predecessor?